Plants produce seeds and seeds are the “eggs” that hold all of the nourishment needed to support new plant growth. They are packed with life-giving nutrients, all wrapped up in a neat and tiny protective shell. For thousands of years, man has used seeds for culinary and medicinal purposes, enjoying their rich and distinctive flavors and health promoting compositions. While you can consume seeds as part of your daily diet, enjoying concentrated seed oil is a great way to capitalize on nutrients. It is similar to the nutritional punch that you get when you juice a load of fresh veggies and fruits as opposed to eating them all at one time. Your body receives a rush of nutrients that can heal and revitalize your body at the cellular level. Like any other food choice, quality matters when it comes to selecting both seeds and seed oil. High quality organic seeds and oils should be sought out for best results. The method of extraction also matters. Many seed oil companies use methods to extract the oils that damage the nutrient value of the oil. These methods include hydraulic and cold expeller pressing as well as solvent extraction. Because of the damage done to the oil components during these extraction methods, these oils must always be refrigerated. This technology is so delicate yet powerful that the precious nutrient qualities of the seeds are left undamaged. The result is high quality oil that needs no refrigeration and will last for up to a year in the kitchen cupboard. Each Panaseeda oil-blend is designed to elevate your health on a multitude of levels. Every organ in your body from brain, heart, liver, kidneys and pancreas - to respiratory, digestive, muscles, joints and skin - from head to toe are dynamically enhanced when you incorporate PanaSeeda oils into your daily regiment, making your life a pure joy to live! 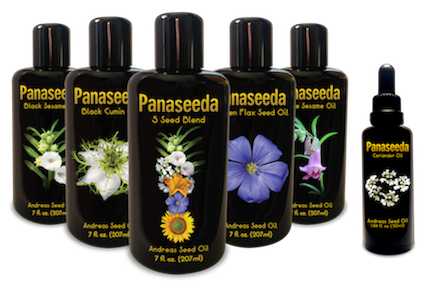 All Panaseeda oils contain the DNA "blueprint of life" and are the perfect blend of nutritional seed oils containing 100% Life Energy - using the most advanced German INSTANT PRESS technology. A blend of fresh-harvested certified organic seeds, tested with Activation's strict quality standards. Pure-pressed using proprietary INSTANT PRESS technology, extracted in a fraction-of-a-second. Instantly sealed in a new premium light-protective Miron Bottle, upon pressing. With a myriad of powerful health benefits including over 20 other pharmacological uses, including... Anti-bacterial, Antiviral, Anti-fungal, Anti-diabetic, Anti-Inflammatory, liver protector and kidney defender. When applied topically, the oil can soothe skin conditions such as psoriasis, eczema and acne. Our most popular oil offering a blend of 5 potent oils including sunflower oil, flax seed oil, black sesame oil, coriander seed oil and pumpkin seed oil You cannot go wrong adding this full spectrum blend to your diet for multiple health benefits. Coriander is an herb that is native to Asia and parts of Europe. Known as a natural antioxidant with anti-bacterial, anti-fungal properties the oil from coriander seeds supports healthy digestion and liver, spleen and pancreas performance. In addition, coriander oil is also used to help regulate blood sugar and reduce overall inflammation within the body. Flax is well known for its high omega-3 fatty acid content. Every tablespoon of flaxseed oil contains 8 grams of ALA (alpha-linoleic acid) making it the richest source of ALA in the North American diet Flaxseed oil also helps to reduce high levels of cholesterol and lower the risk of heart disease. White sesame seeds have been used to treat migraines, PMS and rheumatoid arthritis. If you have trouble-tolerating dairy, consider white sesame seeds, they are a rich source of calcium and vitamin E.
Sesame seed oil has been used since ancient times and is extremely resistant to rancidity. The nutritional profile of sesame seeds is rather astonishing. Sesame seeds are an excellent source of manganese, copper, calcium, magnesium, iron, phosphorus, zinc, vitamin B1 and fiber. Black sesame seed oil may help protect you from cancer while providing support for healthy kidney function. PanaSeeda is the most important food you can ingest to live in your Natural State of Health. We unlocked the life-energy from seeds to give you the most incredible health-producing building blocks you've ever had the opportunity to benefit from. Your Satisfaction is the most important thing to us, so if at any point you're not 100% satisfied, please let us know and we'll refund every penny.